Store in a cool dry place. Once opened, keep refrigerated and use within 1 day. Produced in a facility that uses peanut, sesame and soy bean. 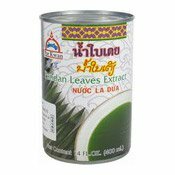 Ingredients: Water, Pandan Leaves Extract (35%), Sugar, Colours (E102, E133).